When I wrote my first baby play post a few months back, I did not realize it would be so popular, but since it was, I made it a regular monthly series. 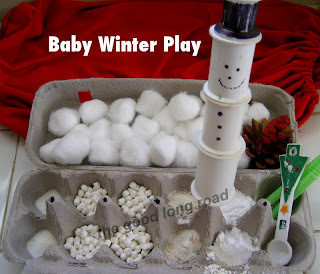 Here is #5, and it is all about simple Winter-themed baby play ideas. I realize, however, that time is ticking away. I expect to share 2 more baby play posts, since my baby will by then by 18 months old, and I will have to admit that he is a toddler, even though there is a part of me that wants him to stay baby. 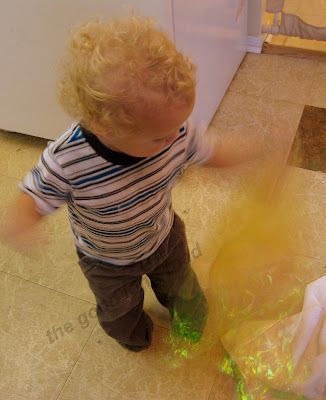 Everyday he says a new word, illustrating more and more his moves away from baby and into toddler. However, when I select items for Baby Play, I share activities that are very similar to things I did with him when he was a much younger baby that I believe will work as baby play ideas for babies in various stages and ages (mostly 9-18 months). 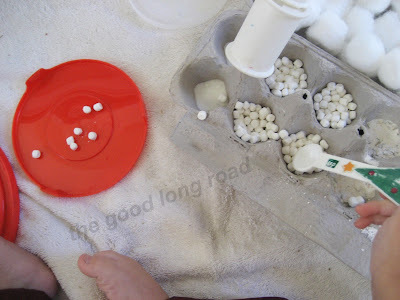 Today, I am sharing some fun winter-themed baby play we have been doing. 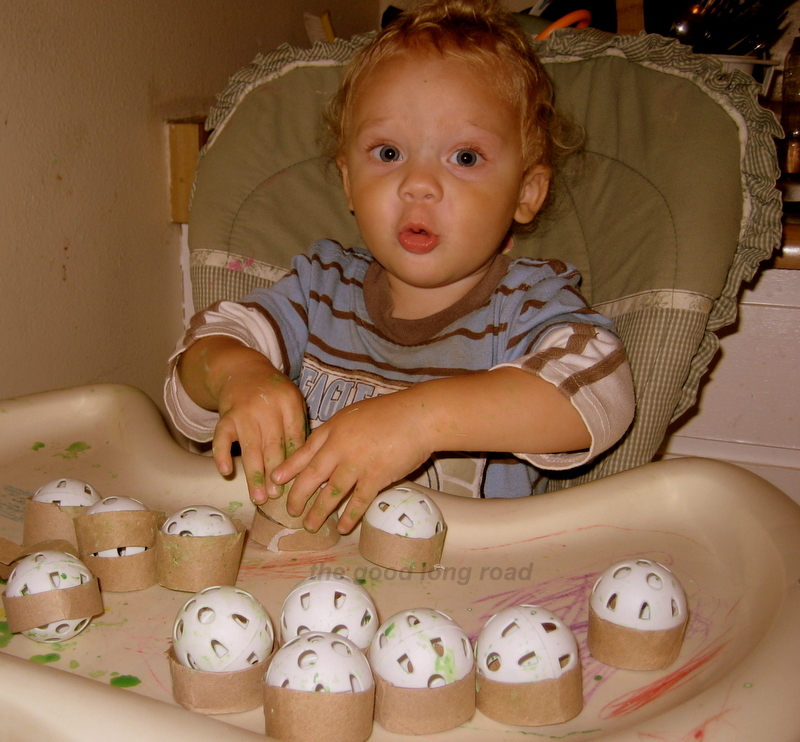 Egg cartons seem to often be in use with my baby (and have been since he was 6 months old), and this week I made him a fun snow sensory bin in an egg carton featuring (left to right) salt, mini marshmallows, leftover flour-oat-lavender mix, powdered sugar, a measuring spoon and two small green straws. 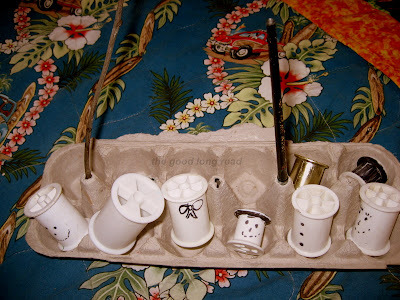 Plus, you have the spool snowman on a stick and then the cotton balls and pine cone in the back part of the egg carton. 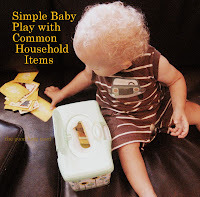 I first discovered the stacking spool fun 3 or 4 months ago and shared it in my second baby play post. 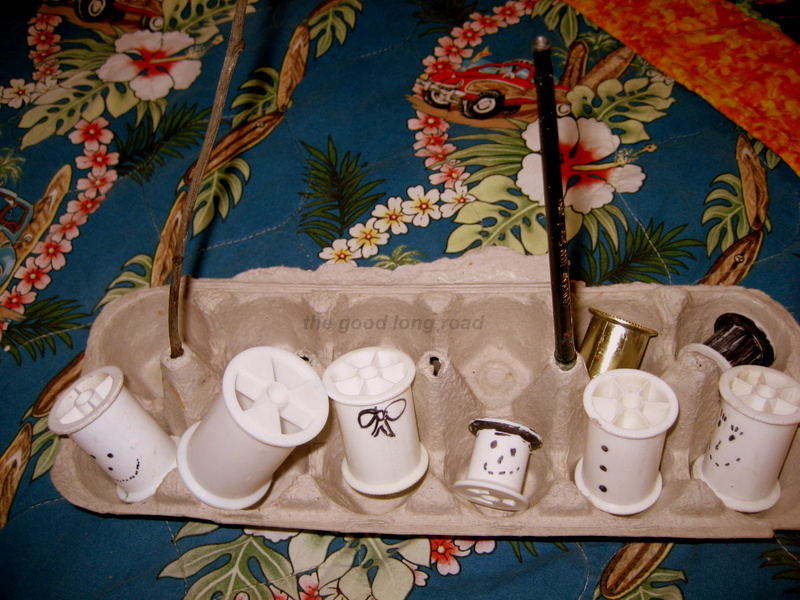 Remembering how much fun he had gave me the idea of creating a snowman out of the spools simply through some basic drawing and coloring with a Sharpie. He loved exploring this sensory bin, especially the mini marshmallows, which of course he ate -- I loved that everything was okay for him to explore with all of his senses since he still does put a lot of things in his mouth! He had fun transferring items and loved the spool play so much that I made another snowman and did a set up on a different day that only involved the spools and sticks. 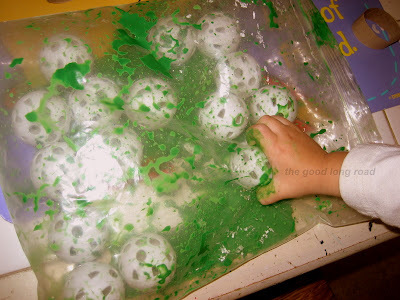 I also froze some water that had been dyed with blue food coloring in big chunks (using a plastic serving platter I bought at the dollar store) and added the chunks to a soapy container for some simple iceberg play. 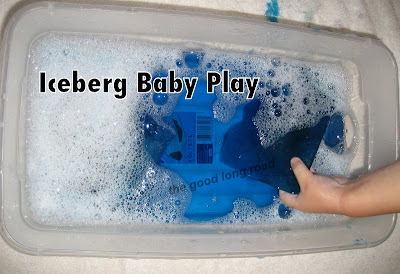 While a bit on the messy side, he had so much fun - he especially liked to pick up the iceberg and drop it back into the bin to make a big splash (hence a big mess). 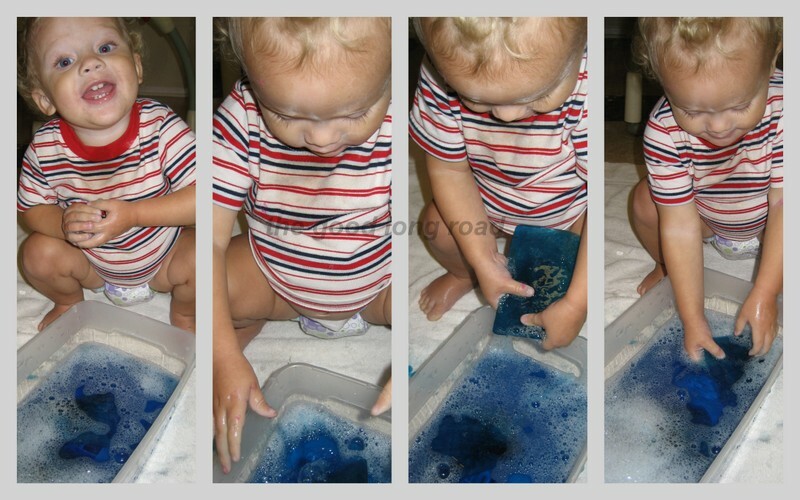 This was an activity that I was glad I did while his brother was napping because I think the mess of two of them splashing around would have been a bit too much. It started simply enough. Then came the paintball experiment. 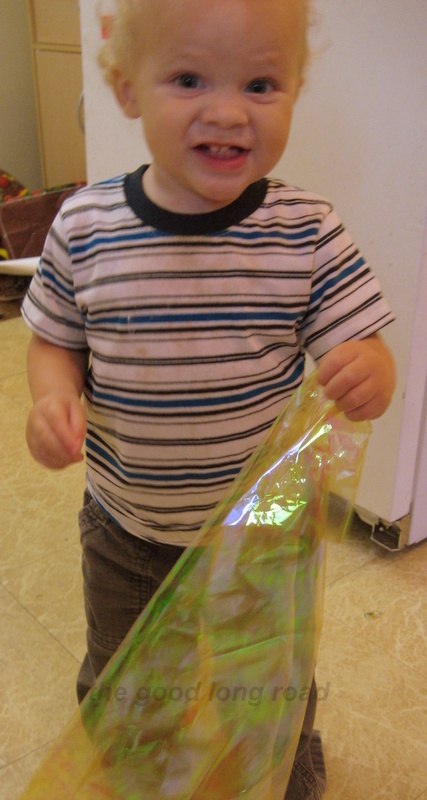 The baggie kept the mess contained, but he actually got bored of this pretty quickly. (I think other little ones might absolutely love rolling the ping pong balls around in paint.) So, I continued to let the activity evolve moving him to his high chair and was glad that I did. I was surprised at how much fun he had taking the balls in and out of the toilet paper roll rings. Sometimes they would get stuck, but that seemed to only increase the fun. He seriously sat in his chair and played with these for quite some time, possibly even an hour. 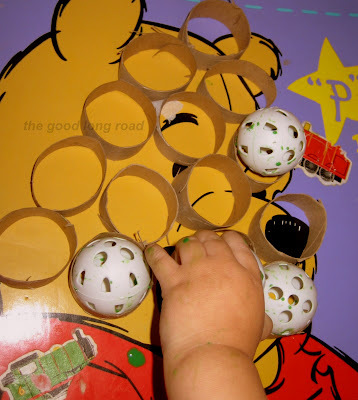 I was glad that I had followed his interest with the activity and that I added the element of the toilet paper roll rings, otherwise, he would have just been throwing the ping pong balls all over the place - fun for him, but not so much for me. Finally, our simplest winter play of all is not really winter-inspired at all, but relates since it involves shiny tissue paper, which we only have on hand because of the holidays. You guessed it, the entire activity is shaking the wrapping paper. Who knew? 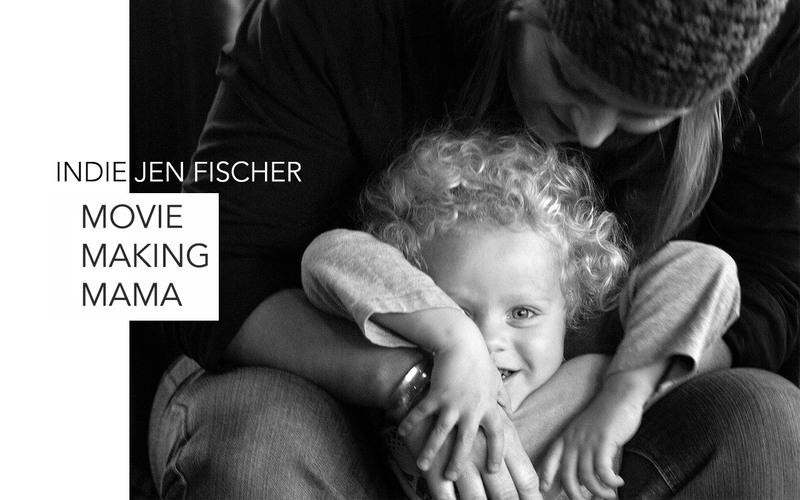 What have you and your baby been up to lately? Sharing this at Tuesday Tots! Pop over for lots of fun baby and toddler play ideas! Adorable! What fun ideas. We will have to use some of them for our little one for next year's winter unit (she will be 15 months...what!). I will pin it to my pinterest board for her, so I can keep these great ideas in mind. Thanks!